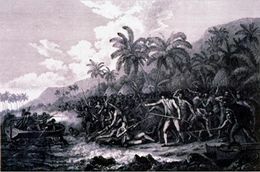 Captain Cook and the crews of the Discovery and Resolution arrived at Kealakekua Bay in late 1778 at the start of the Hawaiian harvest and tax paying season known as the Makahiki. Greeted ritually as gods and presented with gifts and offerings, Cook and his men drew heavily from the resources of the area to provision their ships and left February 4, 1779, amidst increasing tension between natives and crew members. While proceeding along the Kohala coast, the ships encountered a gale. A damaged mast on the Resolution forced the ships to return immediately to Kealakekua to make repairs. After armorer's tongs and later a cutter was stolen from the Discovery, Cook went ashore February 14 with nine marines and attempted to take Kalani`opu`u, a powerful Hawai'i island chief, as hostage. A scuffle ensued between the Hawaiians and Cook's shore party in which Cook and four marines lost their lives. Cook, Britain's greatest navigator, was 51 years old at his death. After the skirmish, a truce was declared, communication was resumed and the damaged mast was repaired. After the British requested the return of Cook's remains, the Hawaiians returned personal effects and part of Cook's body. The Resolution and Discovery left Hawai'i February 22, 1779 under the command of Captain Charles Clerke and Captain James King. An eyewitness account by Lieutenant Molesworth Phillips, who received a spear wound in the conflict. Marines were falling on the rocks or as they began to wade out, tantalisingly close to salvation. Private Harrison appeared to the boat's crews to be literally hacked to pieces. Tom Fatchett went down too, his head as red from gushing blood as his uniform jacket. John Jackson, Oldest of the privates and a veteran who had survived a long campaign in Germany, was struck by a spear in the face, just below the eye. Screaming with pain, he attempted to draw it out, and it broke off, With blood pouring from the wound, he waded out and fell into the sea... Our unfortunate Commander, the last time he was seen distinctly, was standing on the water's edge, and calling out to the boats to cease firing, and to pull in. If it be true, as some of those who were present have imagined, that the boat-men had fired without his orders, and that he was desirous of preventing any further bloodshed, it is not improbable, that his humanity, on this occasion, proved fatal to him... having turned about, to give his orders to the boats, he was stabbed in the back, and fell with his face into the water.